I’m so thrilled to have nice spring weather but with a lack of rain!!! It was a super wet winter, even to the point of having mudslides that closed an interstate for a few weeks. That’s a very rare occurrence here!! So it’s good to be warm and dry. Woot!!! I’m thrilled to have finally figured out the new video camera settings and have begun making tutorials from my woodshop in earnest. And, I’ve got 3 new posts nearly done, but I have to go back and reshoot one of my videos, as it was done prior to me figuring out all the settings, and I need to change the script a bit. It’s the first in the series for building my new mitre saw station. It has also taken the last couple of weeks for me to study the pattern of posts by others in the niche to ensure I’m including what folks expect in a DIY build type post and to ensure I’m not missing money-making and SEO opportunities. READ: Finding Your Production Groove with a New Site for details. On Friday I completed all of the Genesis theme speed tests!! I tested just the Genesis framework, plus the Genesis 2.8 demo theme. And then I moved on to several of the top sellers, including those made directly by StudioPress and one by a 3rd party designer, all of which had been updated to be fully Gutenberg compliant. Those tests were very telling and I shared all the case study results with my Webmaster Training Level 6 members. Did I miss any popular plugins that you and all of your buddies use? Please let me know in the comments on the blog, or anywhere you see this post online, or in our private Facebook groups, if you happen to be in one of them. And I’ll be running tests between each plugin I add so I can document exactly how much load each one contributes. Then I’ll change to different themes with that load and see what happens, as the themes may present the info the plugins provide differently. I want to get these tests as close to real-world themes as I can. Then I’ll be testing those fully loaded sites with local caching plugins like WP Fastest Cache and WP Rocket to see how much they can help. Next, I’ll be working directly with one of my webmasters to test all of this with the Divi theme framework. And, we’ll be testing one site that was created on Divi and then recreated on Genesis. I’ll be meeting with Kate Ahl later this week to go over all the various pinning methods to ensure that I’m fully testing them in coordination with the different plugins that help our visitors share more of our content on Pinterest. It is my very strong desire to complete all of these tests this week, if at all possible. Yes, it’s a tall order, but I think I can do it. And I think I need to, and here’s why. I interviewed 2 new hosts last week and shared my questionnaires in both my Webmaster and Site Audit Plus client Facebook groups. I’ve got one more host to interview later this week and then I’m moving to one of them. I have to get settled into a new home before I can finish my ultimate speed tests, as at least one of those test sites needs to be on a Litespeed server. And I’m using my home on A2 Hosting right now for that. So, I’ll need to take a new baseline when I move to the new host before finishing those tests. I’ve been doing all of the social share button plugin and theme speed tests on my other 2 test sites, one of which is SiteGround. So, no new baselines or disruptions with those. I also have to get settled into my new host before I can open up a new course. With all of this on my plate, I think I have to face the reality that I can’t get the new Gutenberg course released in March. Well, I can probably get the base how-to-use-Gutenberg part of the course done by the end of the month. 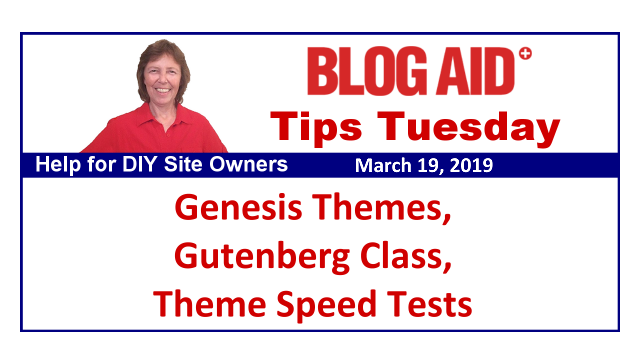 But, I need time to have a hard look at the new Block Suites for design and test those on a few different themes, including those that were in my theme speed tests. That way I can teach the how-to part of the course with those in mind, as I know a lot of you are like me and want to check out new theme building opportunities when you switch to Gute. So, I’m shooting for middle of April on releasing the new course at this point. We’ll see how my research into these new Block Suites go, and what my webmasters have to say about that type of design too. Here’s the thing. It’s all going to be worth waiting for because we’ll all come out with super fast sites where the theme and the plugins coordinate with one another for the least number of requests and least page weight, and still have all the functionality we need. And, after all, that is the point with a theme revamp, isn’t it? Trust me, I’m working on all of this as fast as I can!!!!! I’ve also been squeezing in time to work on the revamp of the Webmaster Training courses. It’s tedious work, as I’m changing things on the backend that you can’t really see. And to be honest, I can only stand to take it in small chunks. It’s just that tedious. So, it’s in the works, but I’ve given myself a couple of months to complete it, along with keeping the tutorials that are there updated, and adding new ones as needed. A vulnerability has been detected and you need to update the plugin asap as most hackers know about it now. Woot!!! I was so happy to see a note in the Cloudflare plugin changelog that the most recent version fixed an issue with a Hooks.php error for some folks when they set their hosting to PHP 7.2. The 7.2 version has always been a little buggy, in my opinion. And I’ve asked folks to stay at 7.1 or go up to 7.3 where available. A2 Hosting has been dragging their feet on making 7.3 available. But, I think it’s everywhere now. So go up to that if you can. READ: Upgrade to PHP 7.1 or Higher for details on making the switch. For the past few weeks I’ve been working with a plugin developer on behalf of one of my clients that was having an issue with the plugin. It was having an issue connecting to their API, which is the encrypted connection for the plugin to talk to their database to import, or make extra info available to that site. And the dev’s first response was to say that the issue was with Cloudflare and their API needed to be whitelisted. Well that set off every red siren I have. Then they said to put in a page rule for the way the API connected to the REST API end point in WordPress. And that set off all my sirens too, as it basically obliterates the extra OWASP protection in the WAF (Web Application Firewall). That’s precisely the stuff that makes paying for the Pro version of Cloudflare worthwhile. Then they tried to tell us that it was coded to the exact specifications given by WordPress, and if I had an issue with it, then I would have an issue with WP itself. I stood my ground and they kept digging. Turned out to be a setting in the plugin, and once changed, the error went away. I’ve advised all of my webmasters and site audit plus clients about this, and that the plugin is now safe to use. And no, I’m not calling them out by name here, as the issue is fixed, it’s a good plugin, and I don’t want to stir the pot on these devs. They are working hard to bring us good stuff. My point in telling you this story is that I see a LOT more of this coming as more plugins try to connect via the WP API. Don’t let any plugin dev talk you into turning off any part of your site security!! And don’t get too locked into wanting to use a plugin that you’re in the least bit tempted to overlook serious warnings either. This is where the education you get during a site audit really pays off. While my client didn’t understand all of the tech stuff, she knew enough not to blindly follow the plugin dev’s suggestion and at least check in with me first. And she knew enough to hold her ground with them, even if it meant not using the plugin, which she was very disappointed about. But she knew she couldn’t risk her site’s security over it. And turns out she can now have her cake and eat it too. So, if something like this pops up for you, please do let me know and we’ll do our best to help the devs create safe plugins for us to use. This is huge news and we touched on it in last week’s DIY SEO Workshop on blog post SEO. Google admitted that they needed to seriously revamp their algorithm for how they determine the date to show in SERP snippets. That REALLY impacts sites like BlogAid, where I cover expiring tech news. It’s not as big a deal on sites with evergreen content, but it still matters in how you revamp your older content, or do tricks to bring it back to the surface on your category pages and news feed. We’ll be going into more depth with this topic as new test data comes in about it and the freshness algorithm, and as we get to the Content Revamp workshop. They continue to make progress on the new Gutenberg features, as well as the new on-boarding features for setting up a new theme like the demo. And, they continue to make progress on how the Customizer works, with adding more things that you can style and change yourself with how the theme looks. At this rate, they may release version 2.10 before I finish with the Gute course and theme revamp service in April, and these changes will likely impact both of those. So, maybe it’s a good thing I’ve had to postpone that course and service for a few weeks, huh? I’m telling you, it’s going to be worth the wait!!! While all StudioPress themes run Gutenberg just fine, some have been made fully compliant to take advantage of all Gute features. A couple of weeks ago I listed out the 6 StudioPress themes that were revamped. Here’s a list of the 3rd party themes they have revamped. Note that the top selling theme, Foodie Pro, is not in the list. Rumors are running like wildfire that it and Brunch Pro will not be updated. I have not been able to confirm anything about these rumors. So we’ll see. When I log into my StudioPress account I see that Foodie Pro was updated to 4.0 on 25 Feb 2019. Yes, but not fully Gutenberg optimized. That is the update that is lacking. I am so itchy to get switched over to Gute and see the new theme design options myself, Tipper!!! !